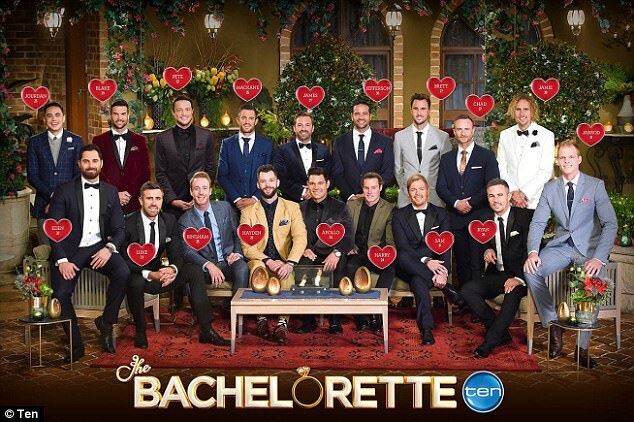 Ten has revealed its 18 bachelors that will compete for Sophie Monk’s affection on this year’s series of The Bachelorette commencing on the network this Wednesday evening. The show will screen Wednesdays and Thursdays at 7.30pm. Despite Monk apparently claiming she was looking for an older chap in his 40s, this season’s cast range in age from 24 to 37. According to an article in Sydney’s The Daily Telegraph over the weekend, a third of the contestants are from NSW and include fashion designer Pete, 32, ex-rugby player Ryan, 26, and voice artist Sam, 31. There’s also events manager Jefferson, 30, who grew-up in Italy, financial adviser James, 31, and business culture consultant Luke, 33. Other contestants include Gold Coast magician, Apollo Jackson, 24, polo player Bingham Fitz-Henry, 25, and Western Australian ‘investor and entrepreneur’ Blake, 29. There’s also Victorian vineyard manager Jarrod, 31. West Australian engineer Jamie is the oldest of the contestants at 37. In late August, Ten released a trailer for the upcoming series where Monk, 37, explained how her public profile had prevented her from finding love. Bingham, 25, Polo Player, Queensland. Blake, 29, Investor/Entrepreneur, Western Australia. Brett, 27, Personal Trainer, Western Australia. Chad, 37, Contact Services Manager, Victoria. Eden, 33, Scaffolder, Western Australia. Harry, 24, Restaurant Manager, South Australia. Hayden, 29, Marketing Manager, Victoria. James, 31, Financial Advisor, New South Wales. Jamie, 38, Engineer, Western Australia. Jarrod, 31, Vineyard Manager, Victoria. Jefferson, 30, Events Manager, New South Wales. Jourdan, 25, Bar Manager, Queensland. Luke, 33, Business Culture Consultant, New South Wales. Mackane, 35, Small Business Owner, Western Australia. Pete, 32 , Fashion Designer, New South Wales. Ryan, 26, Construction Foreman, New South Wales. Sam, 31, Voiceover Artist, New South Wales.